Here is a simple example showing alert in android cocos2D. For this I am using an example from my previous android cocos2D tutorial.. So please read that tutorial before reading this because the I am using the classes and files from it. I am only changing the Gamelayer.java file to show an Alert Dialog when the sprite move is finished. Check the showAlert() function which will show the Alert. Please copy all other files from this project before proceeding. A sample project is available for download for this tutorial. Thanks for your tutorial, It works great. 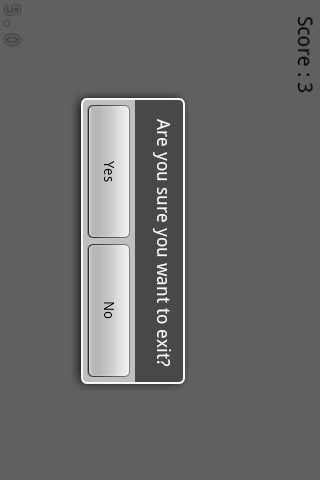 But i need to go to another scene when i click on No option on the alert, How can i achieve that. Please Guide me.